The Sony Xperia XZs was launched on 3rd April, 2017 in India. The device features camera ahead of its time, equipped with the new motion eye camera. This camera has a memory stacked sensor and records 960 frames per second. The steadyshot with intelligent active mode reduces shake, with image stabilisation compensating for movements in five directions. The durable IP65/68 rated construction, prevents the device from rain and dust. The smartphone is equipped with DSEE HX, taking to the high resolution of audio. Play anywhere around the house, with PS4 Remote Play letting to lose in gameplay. The Sony Xperia is available in Ice Blue and Black colors. The device comes with a 5.2 inches capacitive touchscreen full HD display, with a screen resolution of 1080 x 1920 pixels and display type of IPS LCD. The handset also feature TRILUMINOS display, with X reality, dynamic contrast enhancer. The smartphone makes use of a quad-core Qualcomm MSM8996 Snapdragon 820 that is coupled with Adreno 530 GPU, 4GB RAM and 64GB storage default memory capacity. This storage can be expanded up to another 256GB with the help of a microSD card. For imaging, the device sports a 19MP camera with 2160p@30fps, 720p@960fps, Geo Tagging, HDR. The rear camera features 1.1 cm Exmor RS, Pixel Pitch 1.22micrometer, BIONZ- for mobile image processing engine, 0.5 quick launch and capture, predictive capture, anti-distortion shutter, triple image sensing technology, x8 digital zoom, predictive hybrid autofocus. Up front, the smartphone makes use of a 13MP selfie camera coming with 8.3 mm Exmor RS, featuring steadyshot with intelligent active mode. The connectivity aspects include Wi-Fi 802.11 a/b/g/n/ac, dual-band, Wi-Fi Direct, DLNA, hotspot, v4.2, A2DP, aptX, LE, v2.0, Type-C 1.0 reversible connector; USB Host, with A-GPS, GLONASS, BDS and dual sim (Nano + Nano). The device packs a non-removable Li-Ion 2900 mah battery, with Qualcomm Quick charge 3.0. The battery also features Stamina mode, Qnovo adaptive charging, battery care and smart stamina. The smartphone runs Android 7.1(Nougat), out of the box. Jump directly into an existing conversation on Google Messenger or start an entirely new one - all straight from the app icon. The device comes with Fingerprint sensor, unlocking the device blazingly fast in a secured way. The Xperia XZs price in India starts from Rs. 37,499 for 4GB and 64GB variant. Sony Xperia XZs has received a massive price cut in India and is available at Rs. 36,399 via the online retailers. Sony Xperia XZs that was unveiled at the MWC 2017 tech show in February was launched in the Indian market back in April this year at a price point of Rs. 49,990. Other than the Android Oreo, the update for Sony Xperia XZ and XZs also includes the November security patch. The Sony Xperia XZs is confirmed to launch in India on April 4. 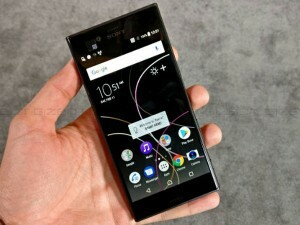 Sony Xperia 1 with 4K HDR display slated to launch on April 26 in Taiwan. The Sony Xperia 1 packs a big 6.5-inch OLED 4K HDR display panel with an edge-to-edge design.